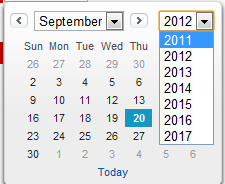 I have created a List View Button, where I select few contacts and using JQuery, One Contact is selected Randomly. Assuming that you already know how to create List View Button, I will share my Visualforce and Controller Extension code with you. Also, Please note that to run this demo, you need to have JQuery file in your static resource with name “JQueryAndCss”. I have searched a lot for any library available for the Gantt Chart however there are very few available on the web. Even i was not able to find out the chart in “Google API”. In this article, i will delineate creating the “Gantt Chart” using JQuery and JSON. In previous article we have seen that how to generate JSON using Salesforce. So continuing the last article, i will use the same JSON reponse to create the “Gantt Chart”. In this example i am going to create the Gantt Chart for room reservation system. for this i am going to use the JQuery plugin for creating Gantt Chart found here. , "desc"  : " Task Desc"
, "desc"       : "<b>Task #1<br>"
Today i came across very known problem of jQuery and thought of sharing same with everyone. In Salesforce the element id is in the format of “j_id0:j_id3:j_id4:c_txt“. In previous post we have already discussed about getting the elementId in Visualforce. After reading this post you will come to know that how easy its to create the Drag and Drop functionality using JQuery.